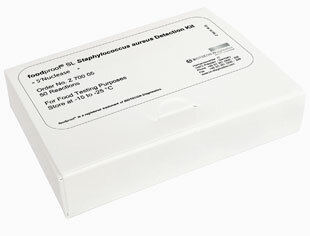 The foodproof SL Staphylococcus aureus Detection Kit is suitable for the specific detection of pathogenic species Staphylococcus aureus in foods. The results are available within 24 hours. Staphylococcus aureus is found almost everywhere in nature, including human skin and in the upper respiratory tract. Usually it does not cause any disease symptoms. However, Staphylococcus aureus is one of the most important pathogens in hospital-acquired (nosocomial) infections. One transmission route is through food contaminated by human contact.